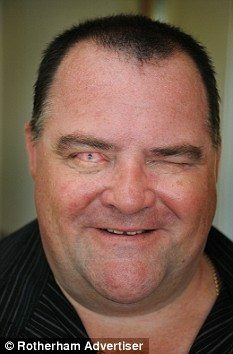 “Blind man sees wife for first time after having tooth implanted into his eye.” Yes, this is real. Yes, this has been done before. Did you ever have anyone give you “the eye”? Here is a true story about someone who lost his eye, and got to see again after using the patients’ own tooth to make a frame for a new cornea. When Martin Jones met his wife four years ago, he never imagined that one day he would get to see what she looked like. The 42-year-old builder was left blind after an accident at work more than a decade ago. 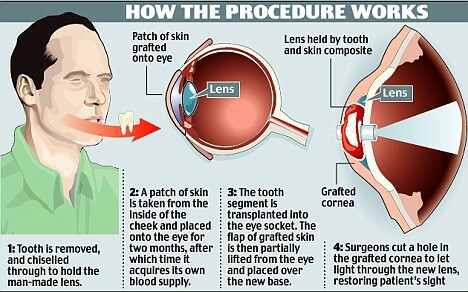 But a remarkable operation – which implants part of his tooth in his eye – has now pierced his world of darkness. The procedure, performed fewer than 50 times before in Britain, uses the segment of tooth as a holder for a new lens grafted from his skin. ‘The doctors took the bandages off and it was like looking through water and then I saw this figure and it was her,’ he said today. Mr Jones, from Rotherham, South Yorkshire, married his wife Gill, 50, four years ago. By that time he had already spent eight years without his sight after a tub of white hot aluminium exploded in his face at work in a scrapyard. He suffered 37 per cent burns and had to wear a special body stocking for 23 hours a day. He also had his left eye removed. But surgeons were able to save the right eye, even though he was unable to see through it. At first specialists in Nottingham tried to save his sight using stem cells from a donor but the attempt failed. It was only when a revolutionary new operation was pioneered at the Sussex Eye Clinic in Brighton that he was given a chance to have his sight back. During the procedure, a minute section of a patient’s tooth is removed, reshaped and chiselled through to grip the man-made lens which is then placed in its core. So a canine – which is the best option due to its shape and size – was taken out of Mr Jones’ mouth. ‘I feel fantastic getting my sight back,’ he said. ‘I can’t really describe it – it’s beyond words. I was blind for 12 years and when my sight came back everything had changed. ‘The first car I saw when my sight was restored was a Smart car and I couldn’t stop laughing – I’d never seen one before and I thought it had been chopped in half. ‘Getting my sight back has changed my life. It is such a precious gift and you don’t really appreciate it until it is taken away . The eight-hour operation, pioneered by surgeon Christopher Liu, is designed to help patients who have corneal blindness but who are not suitable for traditional corneal transplants. ‘When I first heard about the technique I couldn’t believe it. I don’t think many people can,’ said Mr Jones. ‘My friends just don’t believe me . They think I’m pulling their leg or have just made it up. 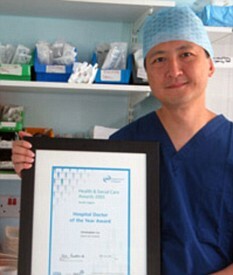 Mr Liu is a corneal specialist and Consultant Ophthalmic Surgeon based at Sussex Eye Hospital, Brighton.. He is also President of the British Society for Refractive Surgery.